Is your skin suffering from dullness, breakouts, or overall sallowness? It might be time for a skin detox. Overindulging during the holidays or while on vacation can lead to a less-than-glowing complexion when it’s all said and done. That’s why we put together this easy skin detox! Follow these tips for five days to cleanse your pores of impurities, remove dead skin, and revitalize your complexion. Your skin is your largest organ, and through perspiration, it’s also one of the major ways your body rids itself of toxins and impurities. Poor skincare habits, like not drinking enough water or sleeping in makeup, can lead to a backup in this system. A skin detox aims to help your skin get back on track by kickstarting the removal of toxins through the skin. Start your your skin detox by treating yourself with a visit to your local spa. A professional facial’s combination of pore extraction, nourishing ingredients, and gentle massage is a great way to regain your glow. Remove all makeup using 2-Phase Makeup Remover. Cleanse skin with gentle soap and water. Gently exfoliate skin using a scrub. Tone skin with an alcohol-free toner. Steam skin by placing a towel over your head and hovering your face over a steaming bowl of water for ten minutes. Rinse off face mask with lukewarm water and a soft cloth. Apply Night Cream to hydrate and restore skin. 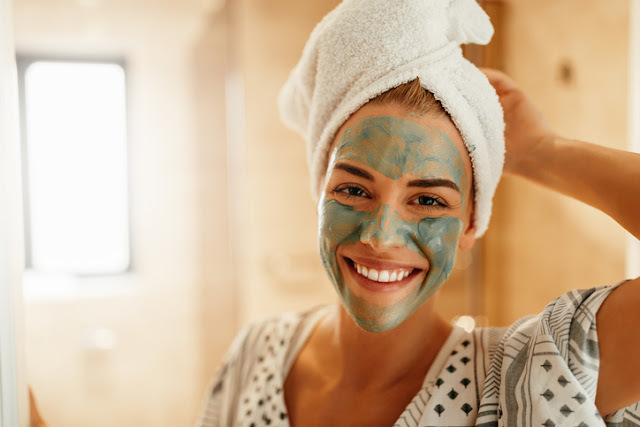 Face masks made with mud or clay draw impurities out of the skin, helping to unclog congested pores and clear up breakouts. Apply a clay mask onto your skin in a thin layer, and allow to sit until the clay has become soft (not dry and cracked). Then gently remove with lukewarm water and a soft washcloth. The foods we eat have a big impact on our outer later. Indulging in junk foods is fine in moderation, but they can still wreak havoc on your skin. During your skin detox, avoid sweets, white bread, fried foods, dairy, and salty snacks. Instead, choose skin-loving, antioxidant-rich superfoods like berries, green leafy vegetables, sweet potatoes, and fish. The antioxidants in these foods will help soothe inflammation brought on by poor diet choices. Focus on Hydration Drinking water keeps skin hydrated while flushing out waste and toxins from the body. According to the Food and Nutrition Board of the Institute of Medicine, women should aim to drink 2.7 liters of water daily, while men should drink 3.7 liters. Sip on filtered water with lemon throughout the day. Avoid caffeine, sugary juices, and alcohol, as these have a dehydrating effect on the skin that makes fine lines more pronounced. Exercise boosts circulation and gets you sweating, which also helps to remove toxins from the body. Any exercise you enjoy that allows you to boost your heart rate and break a sweat will work for this skin detox. For increased detoxification, try hot yoga or visit a sauna. A nice hot bath not only feels amazing, but it can also be a great way to detox your skin. Draw a bath, then add a cup of Epsom salts, a cup of unfiltered apple cider vinegar, and a few drops of lavender oil. These will draw out dirt and impurities from your pores all over your body. Would you ever try a skin detox? Let us know in the comments!